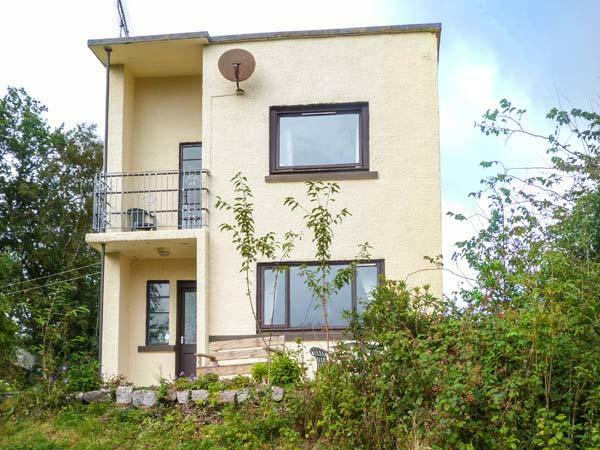 Midway between Salen and Kilchoan on the south side of the beautiful Ardnamurchan peninsula we have THE TOWER a fully self contained circular property for 2, set on the west side of our home, Greenwood. 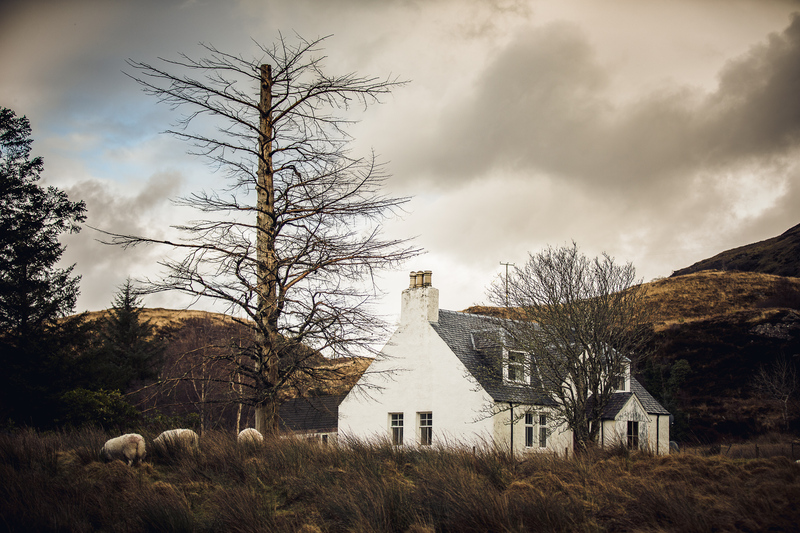 Down near the shore of Loch Sunart, THE RUIN AND BYRE is one unit for 2 adults with accommodation in the Byre for 2 youngsters if required. 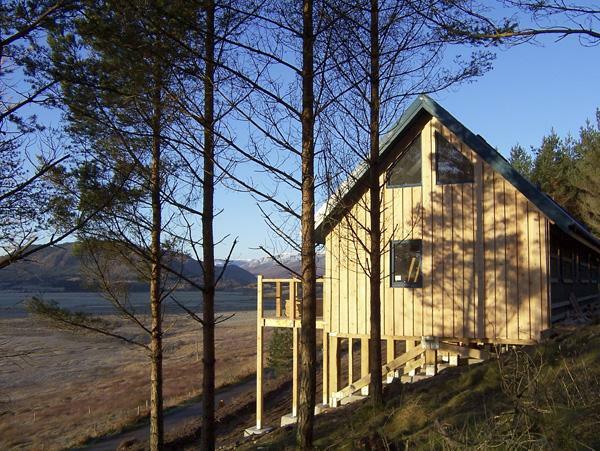 This summer THE FOLLY will be available,offering accommodation for 2 in a unique round timber tower with splendid panoramic views over the loch to the Morvern hills beyond. All our properties are totally unique with many hand crafted wooden features. With wood burning stoves and underfloor heating they are warm and cosy for use at any time of the year. Vistas of Loch Sunart, our gardens and wooded hillsides abound. Otters and golden eagles are often sighted in this area with peace and tranquillity all around.For the more energetic we have a games room offering snooker or tabletennis, a mini gym, two easy to ride road bikes to borrow and a challenging 6 hole putting course. We have just finished our fourth yearly holiday at Lochside Follies and we are already booked and looking forward to our fifth. It is wonderful to wake up in the morning to be treated to an amazing and ever-changing view across Loch Sunart toward Oronsay and the misty mountains beyond. Wildlife is abundant here and it is easy to lose track of time, spending hours spotting new varieties. Lochside Follies is just perfect. The Folly is beautifully designed and equipped and appears to have been crafted as part of the landscape rather than just built. We stayed in The Tower the first couple of years, it is cosy and superbly equipped and we can highly recommend it too. We decided to stay in The Folly instead of the Tower for our third and fourth visits because we extended our holiday time here from a week to a fortnight and we loved the extra space The Folly provides. 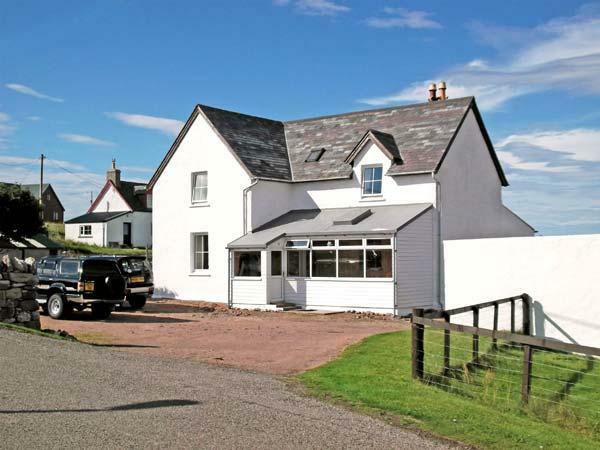 Richard and Lois have worked hard to provide the most perfect retreat from the stress and strain of everyday life and they couldn’t have done a better job. Make up of party: Two - me and my wife. My wife and I stayed at The Folly.We were very impressed by the views. The interior was light and airy. Fixtures and fittings were of the highest quality. The beautifully constructed wood interior created a warm and cosy atmosphere. This was further enhanced by a lovely easy-to-use log burning fire. Lois and Richard ( the owners ) are always very helpful and informative. Needless to say we have already booked The Folly for a week in 2013! Our fifth visit to The Tower , most certainly not our last, although we have promised ourselves a stay in The Folly at some point. Lochside Follies and their creators must rank amongst the best of their kind in the world. Nothing is too much trouble for Lois and Richard , and the only things that cant be guaranteed are the weather (does it matter?) and the sitings of wild life, at which we consistently fail miserably, but then we may not always be looking that hard , so relaxed are we.Do not go to Ardnamuchan if you want "High Street" facilities, retail therapy, cafe culture, nightlife etc. 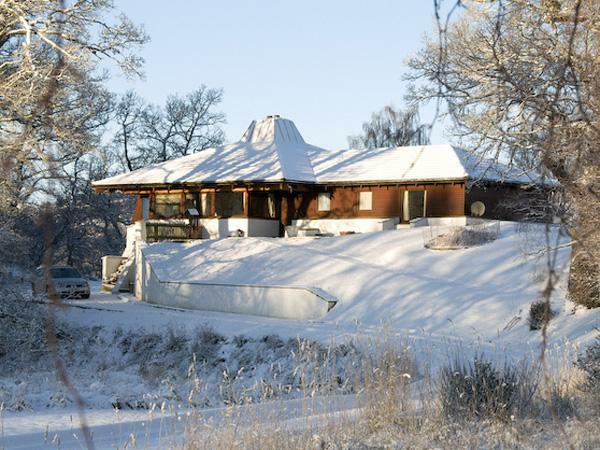 Do visit if the idea of completely getting away from it all appeals , and if you want this with all the home comforts you could require and the most warm and welcoming of hosts , then Lochside Follies is for you. We stayed in the beautiful Folly for a week. Richard and Lois have created an amazing place to stay and we wanted for nothing. The views are amazing, the house was perfect. 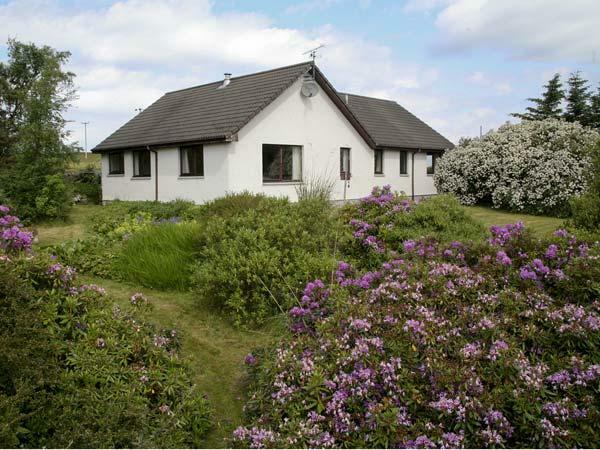 A fantastic location with wildlife on the doorstep. The owners are welcoming and all of their land is beautifully kept, it is a very special place to stay. The Folly has everthing you need and more and is truly 5 star accomodation, spotlessly clean, modern, homely and superbly equipt making it a pleasure to stay in and dine. We shall definatly return. We stayed at the Tower and were delighted with everything.The accommodation was excellent,well equipped,immaculately clean and very well designed for 2 people to stay.Lois and Richard were the perfect hosts and we made good use of the home made meals,jams,chutneys etc on offer.Having 80 acres of woodland and lochside beach to wander in [together with its pitch and putt course]was a real bonus.Beautiful views and lots of wild life completed the package. We were very privileged to be the first paying guests to stay in Richard and Lois's new build The Folly. After having seen it in the planning stage to 4 years in the building it was worth every minute of the wait.We had previously stayed in the Tower on 2 occasions which we thought could not be surpassed. However Richard and Lois have made The Folly into a 5 star gold romantic hideaway. The accommodation has everything you could want and more, beautifully comfortable and finished to an exceptionally high standard. It was a joy to be staying there. We would often return from a walk to find Lois had left us freshly baked scones and home made jam. We can't say enough about the 2 weeks we spent at The Folly all we can do is recommend you go there and see for yourself. We will definitely be going back, we love it. My wife and I stayed 1 week at The Tower at Greenwood. This was our third visit to The Tower in 3 years. 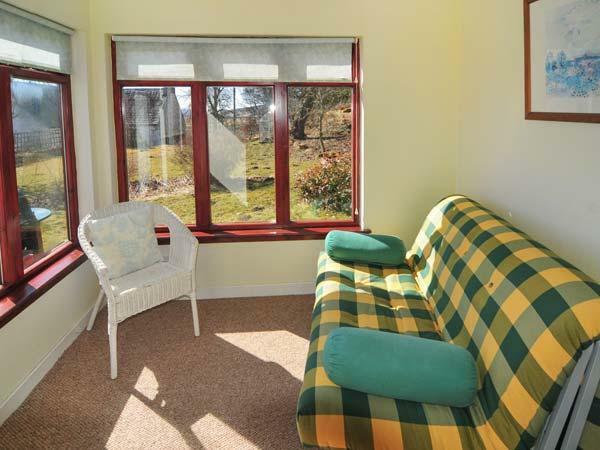 We have returned because the accommodation is always spotlessly clean, well equipped and built to a high standard. The owners are consistently friendly and helpful. They also provide a variety of delicious, home-made fresh and frozen foods. Great base for exploring a wonderful part of Scotland. Words do little to adequately describe how good The Ruin is. 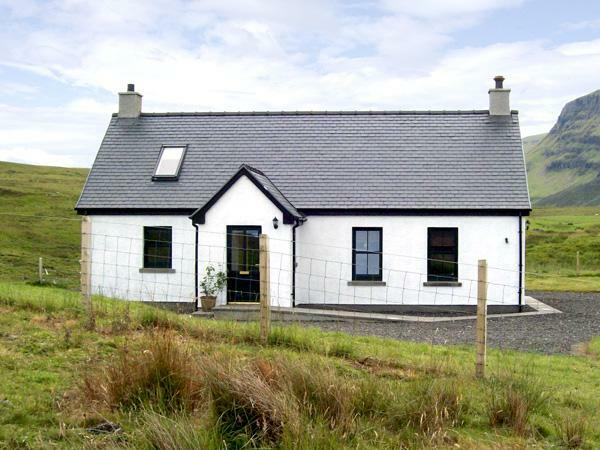 This spacious crofter's cottage has been restored superbly and to an extremely high finish. Add in the location and host of wildlife and even in March this comes close to one of the finest holiday homes we've stayed in. Finally a mention must be given to the highland welcome of our hosts, whose dedication to maintaining the highest standards makes the Ruin a great retreat for any couple. To find a cottage of this quality in an area that you love is wonderful. The Tower is an exceptional property that fulfils all its promises and more besides. It is extremely comfortable and finished to a very high standard in all rooms. Our thanks to Lois and Richard for making it possible for us to have an extremely enjoyable and relaxing holiday with complete freedom. We walked, read and listened to music with ready made meals available if required. Even sat out on the balcony in March and enjoyed it! 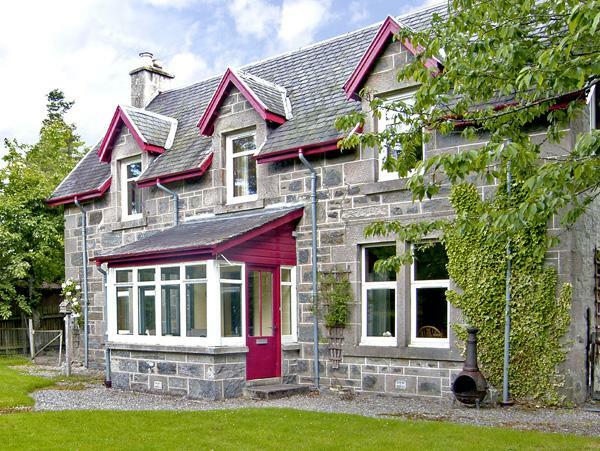 The Ruin is an immaculate, luxurious stone cottage and is located on the wild and beautiful shore line of Loch Sunart. Each day the sunrise over the sea and mountains can be enjoyed from the cottage as otters play and feed in the bay. We only discovered this cottage last year through our friends recommendation. We have been back to it three times already. Ardnamurchan is full of lovely friendly local people who have helped make each and every one of our holidays perfect. Ardnamurchan has the best wildlife watching in the UK. You will see otters, eagles, pine martens and deer. The natural oak woodland is magical along the rocky indented shoreline of Loch Sunart. There is wonderful walking from easy loch side strolls to more challenging mountain walks and adventures to remote hills. Cyclists will find lovely quiet roads and there are tracks and routes for mountain bikers too.